US Amb. David Friedman, at the Kotel for Priestly Blessing ceremony, talks about Gaza protests and Jerusalem. 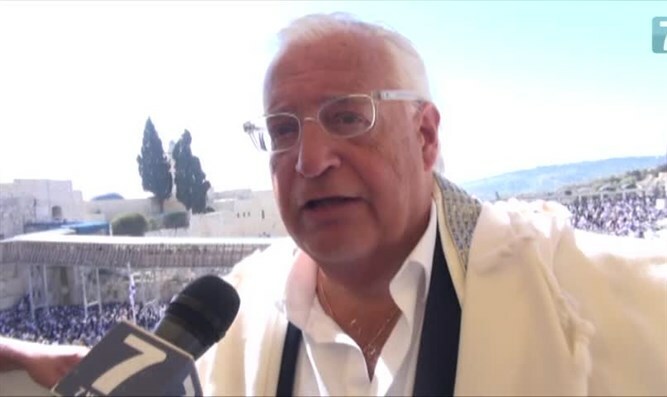 US Ambassador to Israel David Friedman spoke to Arutz Sheva about his personal experience taking part in the Birkat Kohanim (priestly blessing) ceremony at the Kotel (Western Wall) on Monday morning. "It's always exciting to be here," Friedman said. "Every day it's exciting to be at the Kotel, and especially exciting to be here for Birkat Kohanim, such a tremendous collection of kohanim, of Jews generally, that are coming to celebrate Pesach (Passover) and to receive the brachot (blessings) from the kohanim." Friedman, who himself is a kohen, added, "It's a great privilege and honor for me to be here with three generations of kohanim - myself, my son, my grandson, all came here to bless the Jewish nation." He also noted the significance of US President Donald Trump's decision to recognize Jerusalem as Israel's capital. "I'll let others judge about history but it's very exciting for me to be here, and I think because of the special actions and the courage of President Trump, it's especially meaningful to be here this year, after the President recognized Jerusalem as the capital of Israel and as we're getting ready to move the Embassy to Jerusalem," Friedman emphasized. Friedman also noted the violent nature of the recent protests in Gaza, emphasizing that it is "not in the interests of the Palestinians" to continue the pattern. "I think people have the right ot protest peacefully," he began. "But unfortunately what I've seen is something very different than peaceful protests - very dangerous activity, rushing the border, throwing Molotov cocktails, burning tires, putting women and children on the front lines." "That's obviously much more serious than peaceful protests and I think it's not in the interests of the Palestinians for that to continue."